Give your Christmas gifts and decorations that unique and unusual touch this holiday by having them personalized by artist Robert Francis. 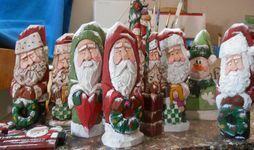 Looking for Personalized Ornaments, Old World Santa Claus figures, Christmas or Seasonal Gifts ? Drop me a note at the studio. I will need a price range and size to quote your custom work. Contact Robert Francis for your personalized art work.